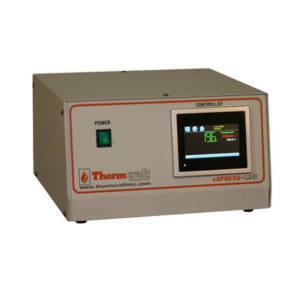 Industrial Furnace Control Systems | Thermcraft, Inc.
Thermcraft control systems are available for all types of furnace, oven, and atmosphere control applications. From the most basic single zone system to the most complex, multi-zone, PLC, or PC based control system, Thermcraft can provide the solution that works best for your application. Control packages offer many options such as LED digital displays, programmable temperature controllers, SCR power control modules, over-temperature controllers, alarms, chart recorders and timers. Control systems are fused, inter-wired and ready for use when shipped. These are some of the control modules that are used in Thermcraft control systems. If you have a specific control module request, please contact us and we will be glad to work with you in order to meet your requirements. eXPRESS-LINE control systems are available in single or three-zone configurations, with optional independent high limit over temperature controllers, programmable controllers, data acquisition and communications. They are available in either 115 volts or 230 volts and range from 20 to 60 amps. Our most popular eXPRESS-LINE control system is the SmartControl. The SmartControl System combines all of the features of typical controllers, video/chart recorders and data logging systems into a single, intuitive device. The SmartControl provides a 4.3” color touch screen interface with standard, user configurable, runtime features for 1-10 zone control applications. All loop configuration and runtime user access is configurable at the device with no PC software required. SmartControl supports 1-10 control zones, offering up to 4 control outputs per zone, powerful profiling capabilities including up to three event outputs and more. Integrated LAN features include email, SMS (text messaging) on alarm, FTP (file transfer protocol for automated file transfer/data backup), remote access (web and VNC embedded servers) and national timeserver time synchronization are standard. The web and VNC servers allow remote access using a PC, tablet or other smart phone devices. If you can use a “smart device” (iPhone, Android, etc.) you can use SmartControl! User configurable with “slide nav” finger navigation similar to “smart devices” or with a traditional drop down menu system, SmartControl is intuitive to operate and use. With one touch language configuration for all icons, menus and help screens, SmartControl provides ease of use in any one of 28 languages. User configurable with “slide nav” finger icon navigation similar to smart phones or tablets or as a traditional drop down menu system. The SmartControl display is split into two sections; the icon bar and main display area. The Main display area is used to view loop information with configurable tag names, active PV, SP & PID % values, navigation icons and appropriate functions selected; i.e. chart view, PID tuning, profiling, data logging, etc. The icon bar is visible at all times providing one touch selection of the Menu (navigation), Help, Home, Alarm (flashes when an alarm occurs) icons, Data/Time field, Notification Window when date/time selected and Navigation Arrows. The Help icon provides the user content sensitive information for every function. The date/time field provides the current date/time and when depressed a Notifications window is opened. The Notification window provides a one-touch snapshot of current SmartControl activity; i.e. PV/SP values, Alarm, Data Logging, Profile, Security activity and more. Profile Type: System configurable for separate profiles per loop. Profile Start: via touch screen or via Event input. Profile Name: Free form 16 character (max) naming convention with auto append time/date stamp. Starting and Ending SP values (may be individually active or not). Guaranteed Soak & Ramp (GS). Continue from last SP value. Continue from last PV value. Static mode (abort profile) with last static SP entered. Events: up to 3 events per segment. Guaranteed Soak & Ramp: Configurable active or not by segment. Data log PV, SP and PID Percent. Log interval: configurable 6 seconds to 31 minutes with configurable number of days to auto start & name next file (1 to 31 days). File Interval: Once started a data log file is configurable to auto end and start new file with the same name as previous file with an appended time/date name. Configurable time interval is from 1 to 31 days. Operator Comments/Events: Unlimited operator comments/events linked to each file entered manually or via Bar Code Scanner. Digital Signatures: full support for user based digital signatures for each data file (data encryption). This is an example of a touch screen PLC based control system that is used to control a furnace and automatic product manipulator. This is a four zone control system with high limit switches and amperage displays for each phase of each zone. The interior view shows some of the state-of-the-art components used in Thermcraft control systems. This four zone control system has high limit switches and expansion slots for up to four more zones to be added in the future. This is the rear panel view of a LAB-TEMP control system. The blue area is for thermocouple inputs, below that are the main breakers, to the right of the breakers is the communications port, and the interconnecting cables shown are ready for connection.